Actionfast Plumbing – We don't monkey around! Apartments, rental units, stores, restaurants, offices, businesses of all types—ActionFast Plumbing is your single best resource. 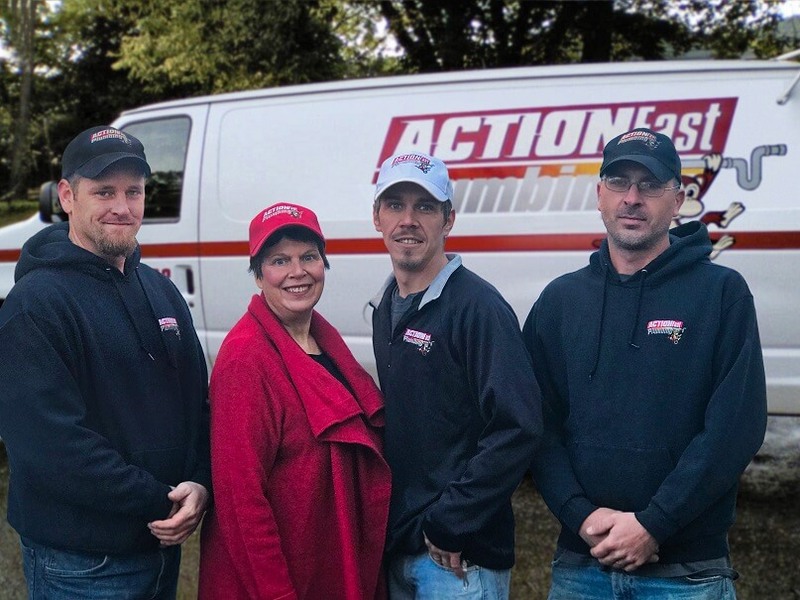 Whether it’s seamless gutter installations, bathroom remodels, or plumbing service calls–ActionFast Plumbing has the expertise to handle it all. Hospitals, factories, and schools–ActionFast Plumbing has extensive experience with complex industrial plumbing projects. We partner with some of the best contractors in the area to ensure your new home or facility is built to the highest standards. From fixing clogs, leaks, low pressure issues, and frozen pipes; to installing water heaters and renovating bathrooms—we do it all. We now offer residential and commercial seamless gutter installations; a natural business expansion that lets us handle all of your water maintenance needs. From left to right; Jed Delamater, Peggi Munkittrick, Stephen Munkittrick & Erick Ballard.